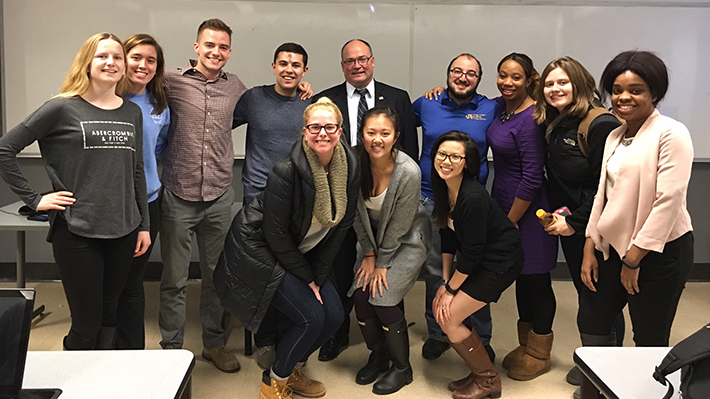 This winter, 14 students from the LeBow College of Business are using their classroom experience to consult on one of the most talked-about public issues – the relationship between law enforcement and the communities they serve. The consulting class is part of an initiative that involves more dozen collegiate teams across the country competing to come up with the best idea for the Peer 2 Peer: Building Community Trust Initiative. Advised by clinical professor Dana D’Angelo, the LeBow class created a consulting firm, META Consulting, to take on a challenge presented by the Department of Justice. The firm’s research team took a multidisciplinary approached to the task at hand, using psychological data to identify their target audience for the project – high school students between the ages of 13 to 19. They believe working with this population can make the most impact, based on the study of identity and moral development at this age. The main goal of their final program is to dispel mistrust between the community and law enforcement by empowering them to seek out the truth beyond just what the media presents. The team has begun development of their program, which they titled the RETIRE It Movement (Real Education to Inspire the Right Engagement) and hope to pilot the program in the West Philadelphia community through partnerships with Covenant House and West Catholic High School. The program will include both virtual and physical opportunities for education and engagement. They will present their final plan to the Department of Justice in April. The students worked with various departments across the College to support their efforts with a focus on public relations, strategy, research and advertising. They also received additional advisement from former Philadelphia Police Commissioner Charles Ramsey, Brian Michael of the Department of Homeland Security and Detective Eric Rios of the Camden County Prosecutor’s Office in developing their program proposal. Ramsey recently joined Drexel’s Lindy Institute for Urban Innovation as a distinguished visiting fellow following his retirement from the Philadelphia Police Department. He joined the class during week five to review the students’ proposal and offer feedback. Find out more about the project by following their ongoing efforts on social media: Facebook, Twitter (@RETIRE_IT) and Instagram (@RETIRE_IT). In its second year of recognizing distinction in analytics, Drexel LeBow announces the 2017 Analytics 50 honorees. At LeBow, we teach differently. Our students don’t just learn in the classroom; ample opportunities for hands-on learning outside the classroom provide a better understanding of the big picture.